Tike Smart's Premium 2-Pack Kick Mats are the best seat back protectors on the market! Other kick mats have unsightly straps that get in your way and cause discomfort to your back. Our seat back protectors feature our unique "Invisible Strap" that tucks neatly between the seat back and seat cushion, keeping it out of your way and unseen from the front of your seat. The "Invisible Strap" also pulls the kick protectors down tightly for a perfectly crisp look. These seat back protectors are for the discerning buyer who wants the best product available. Our automotive seat protectors will let you ride in style, with tan (beige), gray (grey) and black color options that match your interior leather or upholstery, while they protect your car's interior leather or upholstery from dirt, sand, water, mud and scuff marks left by children's shoes, kids' feet or your dog's muddy paws. These seat protectors use the highest quality water-proof PVC-coated polyester fabric and superior workmanship. Simple to install - click in place using only two buckles. Wipe clean in seconds with a damp cloth. 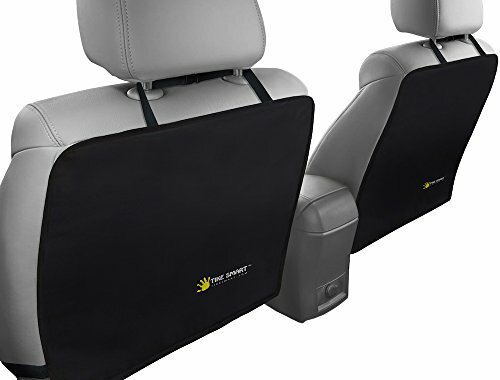 With a generous 22"x17.25" size and adjustable/elastic straps, these seat back kick protectors fit most cars, minivans and small/mid-size trucks and SUVs. Can also be used as a car seat cover for the front side of your 2nd or 3rd row seat, for use with rear-facing car seats! We back our products 100% for life - these seat back covers are guaranteed to last and guaranteed to meet your expectations - or your money back. Please note: The "Invisible Strap" fits through the gap between the seat back and the seat bottom cushion, and it is compatible with most cars - please see the "Instructions" photo at the top of this listing and ensure compatibility with your car's seats. NO MESS - Exclusive "invisible strap" keeps the kick mat attachment strap neatly tucked away and hidden from view from the front of your seat (see below for details). With our car seat protectors, you can have kids and a nice car too! No other brand of car seat cover, seat back protector or kick mat has this feature! In a black color that matches your car's interior leather or upholstery. BEST MATERIALS FOR INSTANT, EASY CLEANING - Smooth surface wipes clean with a damp sponge. Easy-Clean Heavy-Duty Waterproof Polyester Fabric. 22"x17.25" size makes this kick mat a great child safety seat accessory and auto accessory - fits most cars, minivans and small or mid-size trucks & SUVs. Better seat protection than a car seat back organizer, with no messy pockets. Easy to install, with a Lifetime Money-back Guarantee! Please note: "Invisible Strap" fits through gap between seat back and seat bottom (works with most car seats) - please see "Instructions" photo above and ensure compatibility with your car's seats. GUARANTEED: We back our car seat back kick protectors 100% for life, and you are free to return these automotive seat protectors at any time with no questions asked! We love our customers, and they love these 5-star kick mats! We currently enjoy a very hight rating, with many, many 5 star reviews! If you have any questions about this product by Tike Smart, contact us by completing and submitting the form below. If you are looking for a specif part number, please include it with your message.